Standing two metres, or six feet six inches, tall in his stocking-soles places Iain P W Robertson at an unfortunate disadvantage in quite a number of motorcars, a factor that he finds occasionally quite galling. Invited to drive the latest Jaguar F-Type, I was champing at the bit awaiting the opportunity. However, upon reaching the car for the first acquaintance, to say that I was utterly crestfallen would be an understatement. Thinking back, I can recall being among the ranks of motoring writers flown out to Main, in Germany, for the launch of the enthralling Chrysler Crossfire. No matter whether I were in the passenger seat, or behind the controls, the same issue was brought to bear. Whenever I am invited to test a car ‘on track’, as I will be in a couple of weeks’ time for the new Seat Leon Cupra, thanks to Health and Safety concerns, I am now required to wear a ‘skid-lid’ on my bonce, even though I am not driving ‘competitively’ and it is a road car not equipped with a roll cage, or any of the fineries of a racing vehicle. The only real issue is the same one that afflicts me with around 50% of all modern motorcars. I cannot fit, in any degree of comfort, especially while wearing a helmet. Well, here’s the irony, I put the latest Land-Rover Discovery to a comprehensive on- and off-road test just a few weeks ago, you might have read the story. This extremely large and ‘accommodating’ estate car, with its long wheelbase and purportedly comfortable seats actually struggled to slot me between driver’s seat-back and steering wheel. Why? Because the seat-runners do not go back far enough, because Land-Rover’s marketing department needs to show to buyers that the space in the rear is ‘limousine-like’. It is a ‘selling-point’, apparently. It needs to be said that I struggle with a lot of South Korean, Japanese and, more lately, the Chinese models. Without wishing to throw too many brickbats at the vertically-challenged Orientals, a factor that I can confirm after visits to Seoul, Tokyo and Beijing, most noticeable when crossing main roads en-masse, I simply tower over every single one of them. While two metres of height is not extraordinary in northern Europe, I needed sunglasses and a pocketful of sign-pens to deal with the legendary status of celebrity that height brought with it in the Far East. On the subject of enormity, it has become abundantly clear to me that our Gallic neighbours suffer from a bit of ‘duck’s disease’ too. Renaults are only slightly less restrictive to me than Peugeots, or Citroens, and it does seem as though the larger market products are actually the least capacious, because they obtain all the kit and caboodle, which clearly occupies one hell of a lot of extra cabin space, which might be used otherwise to accommodate me. While the archetypal ‘Italianate ape’ no longer exists in vehicle ergonomics terms, I cannot squeeze behind the steering wheel of the Fiat 500, even though the Ford Ka (on the same platform) allows me to fit. As a result, I can make zero comments one way, or the other, about the diminutive, retrospective Fiat, because I have never driven one and probably never will. At the risk of this becoming a jingoistic rant, the country that surprises me most of all, with its inability to slot the larger framed individual into its various model cockpits, is North America. The quite sizable Corvette is virtually off-limits to me, as is the Dodge Viper, although I can give my calves and toes a workout by slipping my shoes behind the seat and driving caveman-style (and illegally) in my stocking-soles. However, my haven resides in Germany. There is not one Teutonic car that causes me difficulties. 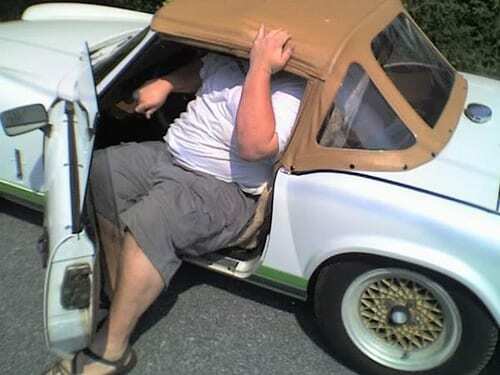 Even the surprisingly compact Porsche 911 offers a cavernous cockpit, in which I can revel and stretch out. VW, Audi, Merc, BMW, even Seat and Skoda, which are basically Germanic offshoots, give me the advantage…mind you, not while donning a racing helmet, there are some limits after all. In fact, I have been a Skoda fan since the late-1990s and my current car of choice is the teensy Citigo that shares its lineage with the VW Up! and the Seat Mii. While it might look ‘odd’ for me to approach and clamber inside the sub-compact Skoda, once inside, I can stretch out, as if I were in the rear seat of a Superb from the same stable. Okay. There is no space for rear seat occupants but that is not the reason I acquired the car. As far as the Crossfire was concerned, launched as it was around the same time as the Nissan 350Z (…nope) and the Mazda RX-8 (…nope), I have never fully comprehended how the Americans could take the otherwise comfortable and roomy Merc SLK and turn it into the ugly duckling Crossfire that was not only shockingly and cheaply assembled but was also impossibly cramped, not just for me. Finally, the F-Type. The soft-top needed to be lowered to allow me to perform a Swiss Army Knife callisthenics manoeuvre to gain access that was impossible had the top been erected. It means that I can all but forget the coupe version, because the side sills will be too wide and the DLO (daylight opening) will be too shallow for me to be able to slide into the cockpit, even disgracefully. I wish to make it known to ALL car designers, who are making cars larger externally (which introduces parking issues) but smaller internally, that we are a growing nation. Many of our Northern European and Northern American cousins are also on an upwards spiral in stature terms. Either increase the available space for both drivers and passengers of increased size, or employ me to be your 99.1% perfect model to ensure that I can fit in the future.